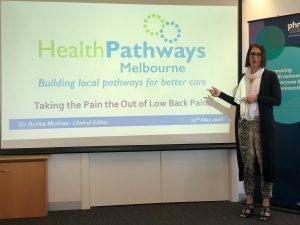 A unique tool and redeveloped HealthPathways for low back pain are among the highlights to come out of a recent educational session at North Western Melbourne Primary Health Network (NWMPHN). The session, held in May this year, was our first ever category one educational session looking at assessment, management and treatment of low back pain. Melbourne Health Advanced Musculoskeletal Physiotherapist, Adam de Gruchy, who presented at the session, was part of a clinical working group which helped to redevelop the pathways for persistent and acute low back pain. 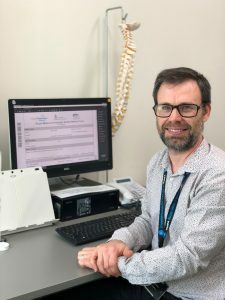 In collaboration with Melbourne Health (MH) colleagues from neurosurgery, orthopaedics, rheumatology and chronic pain services, he also went on to produce a GP spinal referral form designed to improve the quality of patient referrals. Mr de Gruchy, who works in the Back Pain Assessment Clinic at the Royal Melbourne Hospital (RMH), was one of the members of the MH working group that developed the form after the April meeting, when Dr Anita Muñoz led an interactive session to lay down a framework for revising the pathways. He was inspired by a common problem in the triaging of referrals: referrals are often returned due to a lack of information. He said that with a high number of referrals, and not enough clinic time, it is difficult to assess the urgency of each. “We did an audit of referral to all spinal services and found that about a third didn’t even give a reason for referral”, Mr de Gruchy said. “We would get referrals which stated: ‘please see this patient’ with a scan report attached. Mr de Gruchy had previously worked in clinics that had implemented similar forms which improved the quality of referrals. “There is some research done in Sheffield UK, that simply giving guidance in care pathways did not actually improve the quality of referrals, you needed to provide a proforma and return referrals with insufficient information to change practice,” he said. The RMH GP Spinal Referral form is a key piece of work, designed to make the referral process easier. It cleverly reflects considerations outlined in the HealthPathways for low back pain and provides clear assistance to GPs in an otherwise complex medical area. The hard work of Mr de Gruchy and the MH working group, Dr Muñoz and everyone involved in the project will make a positive and significant difference to patients and health professionals alike. This article was amended on 1 November 2018 to acknowledge the work of the entire MH working group.